Posted from Petoskey, Michigan, United States. This is the Zebra setting on the printer itself that an application was some how changing. Recently I had to work with some Zebra GK420d label printers. I had two departments that could print their labels just fine without any changes being made to the printer that was installed on a print server and shared out. 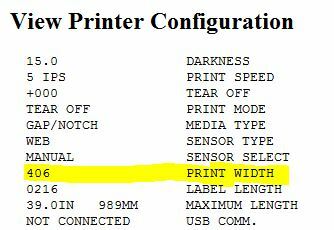 The only change to make was changing the PRINT WIDTH on the device itself via its HTTP GUI. Two departments could print their labels from their application with no problems. Two other departments could not. The two failing department workstations would print a label and the application it seemed would reset the label size on the printer to 831 or four inches. Discovered that the cause of this was because the Windows Default Printer on the offending workstations was set to a Xerox Printer. Setting the Default Printer to an HP LaserJet resolved the issue. What gives? Do I have an explanation for why this happens no, and neither did Zebra Support, but it proved at least it was not them. Posted from Weiser, Idaho, United States.